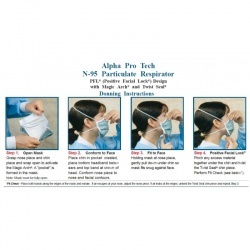 Condition: New product ALPHA PROTECH N95 MASKS CASE OF 6 This Price is for 1 case containing 6 x 35 masks (210 Masks total). The Alpha Pro Tech N-95 Particulate Respirator, designed specifically for use in a healthcare setting, is NIOSH-approved as a Type N95 respirator and meets CDC guidelines for TB exposure control. It has been tested in accordance to Title 42 Code of Federal Regulations, Part 84 (42 CFR 84), which is tested at 0.3 micron size particles at 85 liters a minute. One-Size-Fits-All. "Don't let your first impressions of this mask fool you. Inside of a box that's only 8"x3"x3.5" they have somehow managed to pack 35 NIOSH approved masks, all folded up as tightly as Kleenex. Pull one out and you'd be hard pressed to guess that this is a face mask. It's a rectangle 8" long by 3" wide and maybe 1/8" thick. You could stuff a dozen of these in your purse or coat pocket and not even know they were there. The magic occurs when you open it up. (The box comes with photo instructions) Suddenly you have a 3 dimensional shape that's light as a feather that you can place on your face, secured by two straps that go around the back of your head. We were amazed at how well this mask fit. Many masks have a strip of malleable aluminum on the nosepiece, but this mask goes one further. Its strip extends around the whole perimeter of the mask, which makes it super easy to create a good, tight fit. Breathing was probably the easiest of any masks that we have tried, and that includes ones equipped with a valve. There is a built in arc which provides ample space between your nose/mouth and the mask. This is a mask that one could wear comfortably for hours. There is very little obstruction around the top of the nose, which allows for freedom of vision and would allow you to wear goggles. There are lots of other N95 rated respirators out there. Expect to pay a lot more for them though. If you plan on going to work as usual and want a mask that you can wear all day, they might be a better choice. But any mask should be disposed of once you take it off, as its surface will now be contaminated with deadly pathogens. That might be hard to do when you're paying several dollars per mask. 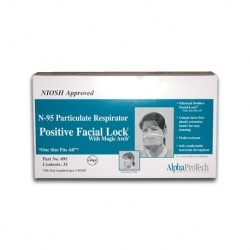 At slightly more than a dollar per mask, the Alpha Pro Tech N-95 is the best bargain around."